Close on the heels of Opera's full fledged launch of its browser, today, Google has released Chrome v27. Google has said that this is a stable release of Chrome 27 after a brief beta testing period. The new Chrome loads 5 percent faster then the previous version. Also with the new release comes, a bunch of goodies. The new API allows users to sync and save content to Google Drive. Google has also rehashed ranking of predictions, spell correction and Omnibox predictions. In all the Chrome 27 has fixed 14 bugs which had been identified by Google and beta testers from around the world, who were suitably rewarded by Google. Another big boost for the Chrome 27 is the new Adobe Flash build in. This would please the harried users who had been stuck with the security issues of old Flash version. The best of all is the interactive 'Conversation' feature in the new Chrome. It lets the users ask any thing and you will get a spoken reply. For example if you ask what is the temperature in Mumbai? It will reply with the temperature at given time. You can then follow up the conversation with a question like will it rain in Mumbai? and get a reply from Chrome. If your question deals with a bigger issue with many search results, the Chrome reply is coupled with information cards supported by Google's Knowledge Graph. 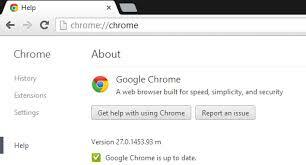 To activate it download the Chrome 27 browser or by going here, go to the settings page and click on the Help line entry option. You will be prompted to restart the browser and you are done. Once you restart the Chrome 27, head straight over to www.google.com and hit the microphone icon in the search box. It will ask you necessary permissions to use your voice and now start asking. Quite sensation update this from Google, coming close on the heels of launch of Opera's browser. This will start the new browser wars of 2013. Keep asking and get spoken results. Plus this article if you like it and comment on the new update from Google. Another thing which I forgot to mention was the Easter Eggs in the new Chrome, spot one and be an instant hero on the world wide web. I have been trying to update it ever since I first saw a tweet about it a few hours ago, but it is stuck at 0%.